Yet even Ma’an showed photos of the injured being helped by members of Zaka, a private ambulance service staffe by religious Jewish men. Two Palestinians were killed on Sunday evening, crushed to death by Jewish extremist settlers in the main street in Haifa, while the third was wounded seriously injured. 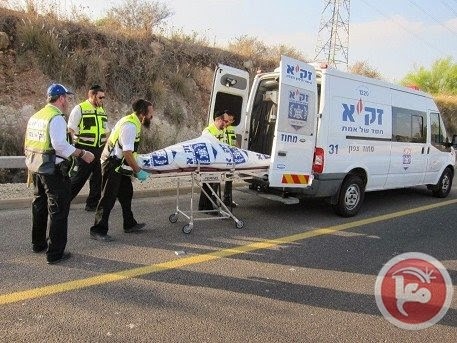 The operation took place when three citizens were on the side of the road working to repair damage to their car, where they were run over by a truck driven by a settler, which resulted in the deaths of two on the spot, while the third was wounded seriously injured. The General Federation of Trade Unions of Palestine said in a statement issued on Sunday evening that the Israeli government must take full responsibility for the death of Palestinian workers due to the truck driven by an Israeli in the street No. 70 in Haifa. “The Martyrdom of workers Zahi Subhi Abu Hamid and Anwar Astal, who lives in the city of Jaffa, ..by the Israeli truck driver comes as a result of racial incitement and the hostile military atmosphere practiced by the occupation against the Palestinian people of all classes in all the cities and villages and towns and its camps in the Occupied Palestinian territories. 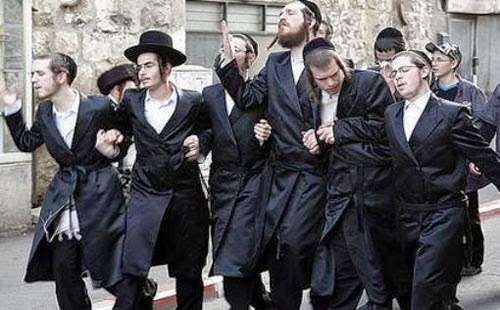 Their graphic for the article, showing what is probably a bunch of Chassidim celebrating Purim, couldn’t possibly be considered antisemitic, right? This entry was posted in Israel on July 7, 2014 by Alan in Australia.